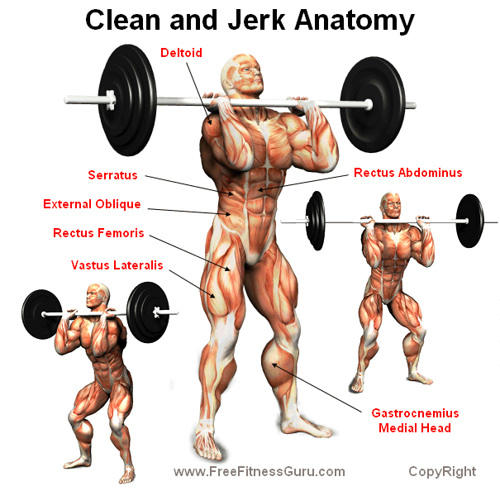 Squat Clean + Front Press + 2 BTN (Behind-the-Neck) Split Jerks (alternating the lead foot on each jerk). The entire combo, once through, is considered 1 rep. Defining the exact number of reps performed on each round of each exercise I did here is tough. What I do know is that I started off doing about 4 full reps of the Squat Clean combo at a light weight, and progressed up to the point of only eeking-out a single full rep, at a substantially increased weight, on the last set. I kept the weight on my pullup belt the same for both the regular and reverse grip pullups, and did 2 reps/set with a regular grip and 4 reps/set with a reverse grip. And again, I alternated grips set to set. I did between 7 and 10 rounds (I lost count) of this superset/combo with plenty of rest/full recovery between sets, while I really pushed to achieve heavier weights within each set. Total gym time was about an hour — an eternity compared to my normal gym outings. It was a really good shock to the system, though — and I do mean that in a good way. I don’t recommend doing something like this often, but I feel like the body responds to an extraordinarilly hard bout every so often, as long as it’s given adequate rest following. I used Monday and Tuesday as recovery days.